Hibs are hopeful that Ryan Gauld’s injury won’t lead to an extended lay-off although the on-loan Sporting Lisbon midfielder will miss Saturday’s Scottish Cup tie against Raith Rovers. The Easter Road club’s marquee January signing was forced off in the second half of Wednesday’s defeat away to Celtic after feeling a twinge in the back of his knee. 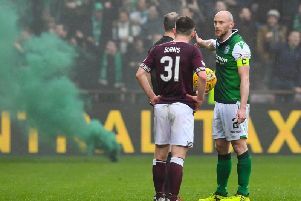 Hibs are still waiting to learn the extent of the 23-year-old’s injury but he will play no part in this afternoon’s fifth-round clash with League One side Rovers. Marvin Bartley, Thomas Agyepong, Martin Boyle and Ryan Porteous all remain sidelined for today’s match.